BASKETBALL SPOTLIGHT NEWS: MLK Classic 8th Grade Preview: New Teams Emerging! MLK Classic 8th Grade Preview: New Teams Emerging! The 8th Grade Division at the MLK Classic will definitely give us a chance to see some new talent. We are anxious to see what team will leave the champion in Pennsylvania. 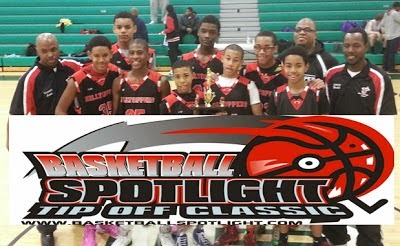 Hilltoppers Heat: The Heat made their name known by winning the Tip Off Classic Blue Division Championship. The MLK Classic competition should be a little stiffer so we will really get a chance to see where they stand. Team Twelve: After making it to the finals of the Tip Off Classic (Orange Division) this Brooklyn crew has to be one of the favorites to win it all. The have enough weapons to get this done. Team Final Black: Last year this group made a little noise in this event as Team Rebels. Maybe playing near their home turf will help them out again this year. Boston Spartans: The Spartans will be taking the long trip with hopes of winning the banner. Their scrappy style might help them get over the top. Maryland Scholars: Word from the Maryland area is that this squad should blow the doors off this event. I remember the name from a few years ago and so suspect they have a group of studs. Pittsburgh Cavemen: The Cavemen will be making their Spotlight debut and don’t be surprised if they make a serious run at the title. I’ve seen them at other events and they always represent themselves well. DC Blue Devils: We don’t know much about this bunch so we will get our first look at them this weekend. PYO: This tough Philly organization always brings the realness when they enter the gym. I’m anxious to see what they have this time around.